A resurgent iPad could alleviate some of the risks facing the company. Apple (NASDAQ:AAPL) shareholders have had a rough month. After a strong start to the year, Apple stock has stumbled -- and while it's still positive for 2015, it has given back most of its gains. 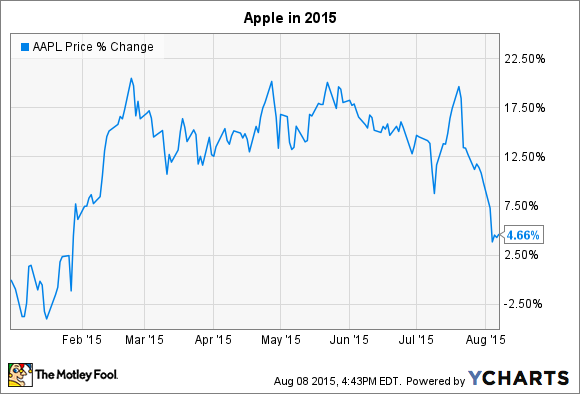 But could Apple shares be due for a resurgence? Below are three scenarios that could send Apple shares higher. Admittedly, a broader market crash could always take a toll on Apple's stock, but these developments would likely be welcomed by Apple shareholders. The iPhone 6 and iPhone 6 Plus have been tremendously successful, with the iPhone's average selling price surging last quarter (up $99 year over year) even as unit sales increased 35%. The larger screens offered by the iPhone 6 and iPhone 6 Plus played a roll, as Apple has seen the rate of ex-Android converts surge to an all-time high. Some fear that Apple may have a difficult time growing the iPhone business in future quarters, as hardware updates will become less significant. But there are reasons to remain optimistic. According to Apple's management, just 27% of current iPhone owners are using a iPhone 6 or iPhone 6 Plus, meaning that there are still plenty of existing iPhone buyers who can upgrade to larger screens. Moreover, Apple's share of the smartphone market has room to grow overseas. The Chinese smartphone market, in particular, remains somewhat in its infancy, with LTE penetration at just 12%. Meanwhile, in the U.S., new plans from the major carriers allow subscribers to upgrade their handsets more often. Customers who once purchased a new iPhone every two years may become more regular buyers. If Apple can continue to grow its iPhone business, shares could head higher. Apple's revenue base is highly concentrated. Last quarter, the iPhone generated nearly two-thirds of Apple's revenue and more than 95% of its revenue growth. It's even worse when you consider that Apple's Services revenue (which generated 10% of Apple's total revenue last quarter and includes app sales, iTunes, AppleCare, and Apple Pay) is largely a byproduct of the iPhone business. If the iPhone business under-performs for whatever reason, it's likely to weigh on Apple shares. Fears that this could happen may have already fueled Apple's recent sell-off, as a one-product company is inherently riskier than a more diversified one. If Apple can grow its other businesses and diversify its revenue base, shares could rise. Rejuvenating the iPad business would be one way to accomplish that. Apple's iPad business has contracted for six consecutive quarters, but CEO Tim Cook believes the business will eventually turn around. Apple has been explicit in its desire to push the iPad as an enterprise tablet, and new features coming in iOS 9 could help spark an upgrade cycle. Booming Apple Watch sales would also help the company diversify its revenue base, give investors confidence that it can continue to innovate, and secure the iPhone's future. As Apple's first major new product in five years, Apple Watch's success would demonstrate that the company is still capable of releasing successful products even without Steve Jobs. Given that the Apple Watch requires an iPhone to function, anyone who spends $350 on an Apple Watch is likely to remain a regular iPhone buyer for the foreseeable future. Unfortunately, Apple has yet to disclose exact unit sales, making it difficult to judge the product's success. Currently, Apple Watch is lumped in with its Other Products category, which saw its revenue rise 49% on an annual basis last quarter, due mostly to Apple Watch. Cook was quick to point out, however, that the situation is a bit more complex given the ongoing declines in the iPod business. Still, Apple may change its policy in the future, or offer up unit sales when Apple Watch breaks particular milestones. Regardless, if Other Products revenue continues to surge, it will likely be because Apple Watch sales have strengthened. Positive reports from analysts or third party research firms could also lead the market to believe Apple Watch sales are strong. If demand is strong, it should be viewed as a positive development and could propel shares.